On 17th Apr 2010 Saturday, me and Uday had been to Madhugiri, Tumkur District, Karnataka. We got a invite from Mr. Jayram, LIC Development Officer, Madhugiri. We had a discussion about govt. school in and around Madhugiri and Mr. Jayram invited us to visit the places and said that if IS can do some thing to these schools. To start with plan was to visit 4 govt school in Madhugiri Taluk but only visited 3 govt. schools. This village in in between the mountains and there is no source of income to the families residing in this village. Total population of this village is around 250+ and most of the families staying here are dependent on the one season corp cutting that will give them around 5K – 10K per year. There is only one govt. primary school and around 50+ kids altogether in school. Post primary if the kid is interested to continue studies then they will go to Madhugiri or one more village near by, both are 6+ KM and no means of transport. Kids have to walk up and down in the hill. Primary School in this village is in very poor condition and there is only one building with 2 rooms and 1 kitchen. This year there would be 50+ kids in the school. Headmaster (Vijaykumar) is very dedicated person and comes from Madhugiri. He is little laud in talking but good and dedicated person. After talking to him face to face we came to know about his work. He is sponsoring one kid to continue his higher studies on his own. Requirement: HM requested for stationaries for kids. What we think: This place is well deserving as its only primary we can support the stationary and also we can have a primary library set up. Kids are not exposed to any out side world except the 250+ ppl interacting. 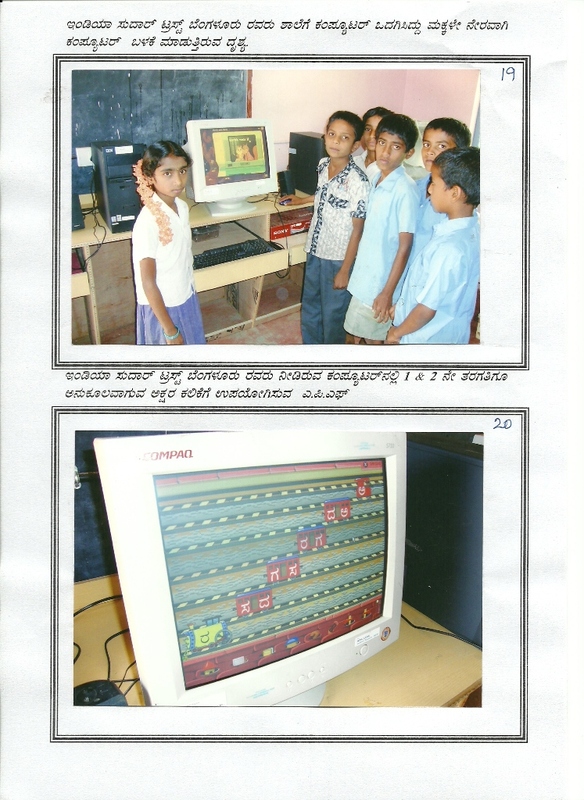 2) Higher Primary School, Siddapura, Madhugiri Taluk. This village is center and considerably big village. This school is well equipped in teachers and one year back from Azim Premji Foundation, Wipro this school has got learning CD’s and 2000 reading library books. Kids have represented school in state level Kho-Kho and Kabbadi. 1) Water Purifier for School : Water in this village is contaminated with floride which will turn the teeth in yellow and then decay in very short period. Almost all the villagers we saw were having dark yello teeth. Initailly we thought its because of GUTKA or PAN but HM clarified that its for Floride contents in the water. 2) Library Rack : From past 1 year not all the books are given to kids as there is no storage rack. 3) Computer Systems required : There were 5 systems and 4 are stolen from the school, leaving one which is in not working condition. HM requested if we can fix the system and get some more systems. School is having ample educational CD’s to run. 1) Library Rack can be provided as school is having lot of books to be given to kids and near by kids. 3) We can run the IS Scholarship programs. As per HM there are lot of kids who are very much interested in continuing higher education. This village are dependent on the Sheep business and Farming. There is only one primary school and strength is 64 for this year. Here we saw "Nali Kali" program implemented for 1st and 2nd standard kids. Program is implemented and executed very well. Head master demonstrated all the "Nali Kali" programs and took us to the room where they conduct the "Nali Kali" program. We have uploaded photos for this. Head master is really helpfull and enthusiastic to do more and more for kids learning. For higher school kids will have to go to Madhugiri. 1) HM requested for stationaries. 2) Any Learn via playing model will help. What we think: Stationaries can be given as the number is very less and can think of coming up with the Learn via playing model. With this we can implement in other primary schools as for primary we cannot run much of programs. There is only one primary school and strength is 64 for this year. Here we saw “Nali Kali” program implemented for 1st and 2nd standard kids. Program is implemented and executed very well. Head master demonstrated all the “Nali Kali” programs and took us to the room where they conduct the “Nali Kali” program. We have uploaded photos for this. Today I visited P.U.M.School Ayyampalayam, near jagathapi karur Dt. The problem is girl students from that school getting married at age of 9 years or 10.This is the custom of that village people(community) Many girl students got dropout due to that.last month 2 girl from 5th std got married to 40 years old guy.she don’t know how to handle this. PROCESS Postal Communication channel opened for rural IS members. As you know well, we communicate with members through email. Its precondition to join as member in India Sudar. email channel having its own limitation, because we have more rural population where people never use email. Even we are seeing lot of rural people who showing interest to join as IS volunteer to serve local community. 1. What is Postal Communication channel ? Any rural volunteers can join as India Sudar member and receive ongoing project update through Postal. This will be posted every month/two. 2. Why we need Postal Channel now ? We planned to build very good rural government school teacher and volunteer network to execute our rural projects. 3. How you can add rural member in India Sudar ? If you find any rural teachers or volunteers, who is not using email and interested to join as IS member, you can collect there Name, Postal Address, Phone no(Optional), Company Name(Job) and Post it to admin . So that we can add the person as member and communicate further with monthly news/activity through postal. You can help us to build Passionated rural IS volunteer network to reach our vision. We are very happy to Introduce “The Origin” as partner Organization to work under IS Open Charity Platform towards common vision. Our Sincere THANKS to Mr.T.Hari, Who made this partnership. About Origin: We are a group of Volunteers from various walks of life who have come together for a Noble cause. It started almost nine years back when we first thought of helping the poor and the needy. We have from then on developed by leaps and bounds with various Philanthropists and Kind – Hearted People joining hands as one United Community in the Service of Humanity. We have named our Monthly Event Team, consisting of our volunteers, as “The Origin”. We have been conducting various events with beneficiaries ranging from Orphans, Semi-Orphans, Mentally Challenged, Destitute & Spastics Children, AIDS affected and infected children, Visually Challenged / Handicapped and Old Age People. We have also conducted various Eye Camps and have taken up Individual Educational Aids for School / College students hailing from poor families and also Medical Aid for needy people. We have also provided Monthly Provisions required by Orphanage Homes, Milk for Poor Children, Unpaid Rents for Homes, Day-to-Day Basic needs for the Homes, Special Classes (Tuitions) for Government School Children, Career Guidance Programme for X Standard Students, Scribes / Readers for Visually Challenged Students. We enquire about Orphanages and Homes and verify if they are genuine, then we get to know their needs and set out collecting funds for the same. It has been by God’s Grace and Mercy that we have been successfully conducting such events, organized and coordinated by our volunteers. Address: The Origin, Chennai, Tamil Nadu.